Prestigious British menswear brand Gieves & Hawkes revealed its newly renovated flagship store at Harbour City and invited guests to the grand reopening cocktail at 6pm on 14 September, 2017 (Thursday). Guest of honour – Mr. Ji Jin-Hee was invited to join and officiate the toasting ceremony with Nick Keyte, Managing Director of Gieves & Hawkes UK, Wan Choe, Senior Vice President of Gieves & Hawkes HK and Agnes Shen, Chief Operating Officer of Trinity Limited. 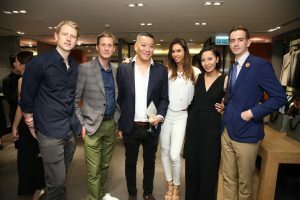 The event also attracted a number of gentlemen in town, including Eric Kwok, Derek Tsang, Alex Lam, Christopher Owen, Jake Astor, Max Johnson, Stanley Sun, Aric Chen, Jamie Lee, Dennis Wong, Derek Yeung, etc. Inspired by the award-winning interior of their global flagship store at No.1 Savile Row, this Asia flagship store at Harbour City features the signature smoked oak paneling, hand-made elements and iron work, tonal colour palette and soft lighting, reflecting the same intimate feeling of rarefied exclusivity and privacy of No.1 Savile Row. 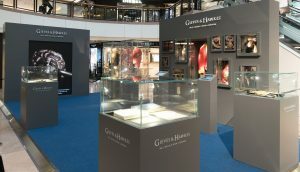 There was also “The Invention of The British Gentleman” exhibition at Gateway Arcade Atrium I of Harbour City, where guests could get access into the brand’s vast and unpublished archives, including Michael Jackson’s tailcoat and Princess Diana’s mess jacket, and explore the profound affiliation between the brand and the British Royal Family. Copyright © 2019 Trinity Group Limited. All rights reserved.